John, Paul, George, and Ringo. The Beatles. The Fab Four. Legends, icons, and lasting pop culture sensations, what is there really left to say? In fact, so much has been written about the band, that I'm sure even that previous sentence actually lamenting the fact that there's nothing left to say about them, has already been written countless times before. Still, the relentless coverage is fully deserved. Once just four humble lads from Liverpool, they are collectively responsible for producing some of the most popular and enduring musical hits ever recorded, and as their fame shot up in America, right at the height of Beatlemania, they of course, made a movie. From director Richard Lester, 'A Hard Day's Night' is an innovative, somewhat experimental foray into satirical, surreal comedy, loose plotting, and frenzied musical performances. A highly influential work, when first released the film essentially created a whole new form of musical, paving the way for pop music videos as we know them. The basic plot follows the famous quartet as they rehearse for a live television concert. We follow band members John Lennon, Paul McCartney, George Harrison, and Ringo Starr (all playing themselves of course) as they take a train ride, practice their songs, chat up women, and deal with mobs of fans, controlling managers, and overbearing press. Though there actually is a script, the story is essentially negligible, with the film's goals extending far off the usual narrative path, aiming for a more unconventional and almost nonsensical mixture of episodic comedy and melodic delight. The humor itself is a fun blend of dry, witty one-liners, and odd, absurdist sensibilities, that mix well with the band members' actual personalities. Quick instances of snarky banter and sarcastic observations are placed against more overtly wacky scenarios and reality bending visual gags. Frequent non sequiturs and meaningless observations are thrown into a gleefully directionless series of sequences that see the band struggle to deal with the pressures surrounding them. Thankfully, not all the laughs are purely irrational, and beneath the surreal humor is some real, biting satirical commentary on fame and the superficiality of shifting trends. Some highlights include poor Ringo's unsuccessful attempts at enjoying the simple things in life, George's run-in with some trend setters, and a lively press party that sees the band unleash amusing verbal jab after jab at the unsuspecting and sometimes oblivious journalists. 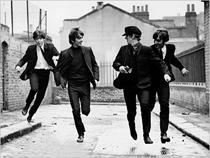 Tying the film's loosely constructed web of comedy and song together, is director Richard Lester. Bringing an innovative and energetic visual style to the screen, Lester essentially pioneers an entire method of filming musical performances. Many scenes forgo classic coverage for a more improvisational, free flowing approach. The frenzy of Beatlemania is captured through montages of shaky close-ups depicting screaming fans and pandemonium on the streets. Fast moving zooms and pans all add energy and excitement, following the band wherever they go. Lester also plays around with frame rates, using slow and fast motion to capture the group's free spirited whimsy. The musical performances themselves often come in the form of random breaks from the normal flow of the story, with songs simply occurring matter-of-factly with no real attempt at transitions. A more traditional approach is taken for the climax, however, which sees the band literally play for a television concert. Multiple cameras capture every angle, giving the viewer an intimate and multifaceted view, from both the audience and the performer's perspective. The opening sequence itself, set to the title track of the film, is perhaps the movie's most iconic scene, and The Beatles running through the streets of Liverpool has become an immortal moment of cinematic history, loudly ushering in a new kind of filmmaking with a catchy, memorable hook. While there is no denying the movie's influence and importance in creating a new kind of synergy between film and popular music, 'A Hard Day's Night' doesn't quite hold the same impact that it once did. The movie has aged remarkably well and never really feels dated per say, but techniques and stylistic choices that once seemed radical and subversive are now rather standard and common place. This of course isn't a real fault of the film itself, and is instead just further proof of how ahead of its time it really was. Even so, the movie's effect can't help but be slightly diminished by the generation of imitators that followed. Through their albums, The Beatles helped shape popular music as we know it, and through their first attempt at big screen success, they helped establish a new form of moviemaking. Lester's irreverent mishmash of zany nonsense, sharp satire, exciting visuals, and great music, was a genuine original accomplishment when it first premiered in 1964. It may not hold the innovative impact it once did, but 'A Hard Day's Night' remains an entertaining, fun, and artfully constructed peek into the fascinating world of celebrity and rock and roll. 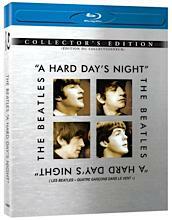 Alliance brings 'A Hard Day's Night' to Blu-ray on a single BD-25 disc housed in a standard case with a cardboard slipcover. Originally a Canada only release, it is now available on Amazon's U.S. site as well. A collectable twelve page insert is also included in the package with shots from the film's famous poster photo shoot. After some logos and warnings, the disc transitions to a standard menu. The movie is presented in a black and white 1080i/AVC MPEG-4 transfer in the 1.66:1 aspect ratio. As a whole, the image is certainly serviceable but never quite impressive. The print is in decent shape but there are periodic signs of damage and age throughout. Despite the interlaced presentation, I detected no combing or other related artifacts in motion. Some minor signs of grain are periodically visible but unwanted video noise is also apparent. Detail is somewhat lacking, especially in wide shots, and the film has a sometimes soft look to it. There is rarely any sense of depth, and the visuals tend to look flat in many sequences. Black levels are mostly good, but can appear elevated in certain scenes. Whites are strong, giving the image a nice sense of contrast. 'A Hard Day's Night' doesn't look particularly bad on Blu-ray, but it also doesn't look particularly great. It's hard to say how much difference a progressive encode or a new source master might have made, but as it stands, this is a pretty average video presentation. The film is provided with an English DTS-HD Master Audio 5.1 track, an English Dolby Digital 5.1 track, and a French Dolby Digital 5.1 track, with no subtitle options. The audio is a bit inconsistent, but does shine nicely when it needs to. What we have here is really a case of two very different audio experiences, with some major discrepancies between the film's dialogue and effects, and the actual music performances. When not engaged in a musical number, the audio is essentially mono, with only the center channel active. When the musical performances begin, the track instead switches to a mostly stereo presentation with virtually no activity in the center channel, and only faint echoes in the rears. Dialogue is rather thin sounding with some occasional pops and crackles, and there is no directionality to speak of during the narrative parts of the film. On the other hand, the music itself, thankfully, sounds great. Vocals are full and rich, and there is some nice separation across the front left and right speakers. Dynamic range is full and bass has some nice kick. Due to the differences in quality and presentation between the music sequences and the rest of the movie, transitions to these performances can be a little jarring, and the songs seem to have been mixed a bit higher than the rest of the audio. While a more consistent sound mix would have been preferable, it's very possible that this is simply the best way the film is capable of being presented. The Beatles' music is as wonderful and timeless as ever, and despite the sometimes harsh transitions, the songs sound good. Alliance has put together an in depth collection of interviews with virtually everyone involved with the production (with the notable exception of the actual band). In total, there is a little over three hours worth of material. Though some of the interviews are more interesting than others, they all offer some nice insights into the film's production and the band members themselves. All of the special features are presented in standard definition with Dolby Digital 2.0 sound and no subtitle options. A play all function is available to view all of the supplements together. Things They Said Today… (SD, 36 min) - This is a look back at the origins of the film, its production history, and lasting impact. Interviews with director Richard Lester, producers, studio execs, and other crew and cast members are included, along with some behind-the-scenes footage and stills. All of the participants offer some interesting bits of trivia and stories from the set dealing with the improvisational style of filmmaking used and the band's impossible popularity. Fans will definitely want to check this out. Their Production Will Be Second to None (SD) - Separate extended interviews with director Richard Lester (12 min), musical director Sir George Martin (7 min), associate producer Denis O'Dell (10 min), and studio executive David Picker (3 min) are included. Each interviewee offers more information on how they got involved with the film and more stories about working with the different band members. Lester's comments on the group's various personalities and approaches to acting are among the more insightful of the batch. With The Beatles (SD) - More extended interviews are included, this time with several cast members. Those featured are John Junkin (4 min), Lionel Blair (3 min), Kenneth Haigh (3 min), David Janson (10 min), Anna Quayle (3 min), Jeremy Lloyd (5 min), and Terry Hooper (4 min). Again, the participants offer details on their experiences working with The Beatles and the crew. Janson, who played the young boy that shares a scene with Ringo in the film, offers a particularly heartfelt interview, and Quayle still seems disappointed that a wink between her and Lennon was left on the cutting room floor. Some minor bits are repeated from the main doc, but these are all a worthy watch. Working Like A Dog (SD) - The production crew is the focus in this section of interviews. Those included are cinematographer Gilbert Taylor (7 min), camera operator Paul Wilson (4 min), hairdresser Betty Glasow (3 min), and second assistant director Barrie Melrose (6 min). Each participant traces the events that led to them working on the film as well as providing more tidbits on their respective roles in the production. Busy Working Overtime (SD) - Interviews with assistant editors Pam Tomling and Roy Benson (4 min), and sound editors Gordon Daniels and Jim Roddan (3 min) are included. The film's inventive editing style is discussed along with some of the challenges that the improvisational shooting style presented and the difficulties involved with syncing the many sound elements. Listen To The Music Playing In Your Head (SD, 12 min) - Here, Sir George Martin analyzes the songs used in the film and discusses their place within The Beatles' evolving musical style. I've Lost My Little Girl (SD, 4 min) - A deleted scene from the film, which featured Paul chatting up an actress, is discussed along with still shots from the sequence. Richard Lester explains that the scene was taken out due to pacing concerns. The actress featured in the sequence also shares some memories about working with Paul and the dangers of Beatlemania. Taking Testimonial Pictures (SD, 10 min) -This is an extended interview with photographer Robert Freeman who discuses his relationship with the band and the creation of his famous poster for the film. Dressed To The Hilt (SD, 8 min) - This supplement presents a closer look at the costumes and suits worn by The Beatles in the film, including information on their unique designs. Out of all of the interviews included, this is probably the most skippable, even for fans. Dealing With "The Men From The Press" (SD, 18 min) - Tony Barrow is interviewed about his experiences as the band's publicist. He offers some more information about the outrageous realities of Beatlemania as well as some insights dealing with the band's unique sense of humor. They And I Have Memories… (SD, 7 min) - Artist and personal friend of The Beatles, Klaus Voorman, shares some of his personal stories about the Fab Four. Some of his artwork of the band is also shown. Hitting The Big Time In The USA (SD, 4 min) - Music promoter and producer Sid Bernstein discusses his role in bringing The Beatles to America. He also talks about the band's laid back, down-to-earth personalities, and the commendable business practices of manager Brian Epstein. 'A Hard Day's Night' is an original, odd, musical satire that features some great performances from one of the greatest bands that's ever been. It may not pack quite the same innovative punch that it once did in 1964, but it's still an entertaining and well made film. Video is fairly average, and though a bit inconsistent, the audio presents the music wonderfully. Supplements are plentiful, but it would have been nice to hear from the band members themselves. Even with some minor technical issues, this is a solid recommendation, especially for big fans of the band.